As well as being responsible for supplying images of books and manuscripts for research and publication, we also take care of image requests for some of the college’s other special collections, including the college portraits and the college silver collection. We recently fulfilled a request for an image of the oldest and most famous item in the college’s silver collection, the Corpus drinking horn. It has been published in a fascinating article by Morgan Dickson on ‘The role of the drinking horn in medieval England’. The Corpus drinking horn was given to the college on its foundation in 1352, probably by our founders, the Guilds of Corpus Christi and the Blessed Virgin Mary and it’s still used today by the Fellows and students at college feasts. The horn is an impressive size, about 70cm from tip to mouth, and holds more than three pints of liquid. It’s believed to come from an aurochs, an extinct ancestor of modern domestic cattle. It has a silver-gilt plaque with the college coat of arms engraved on it and a finial depicting the head of St Cornelius, patron saint of horns. Dickson’s article traces the significance of drinking horns from demonstrating the generosity and patronage of Anglo-Saxon lords at feasts and among grave goods through their depiction at Harold’s feast on the Bayeux Tapestry to their roles as vessels of conviviality at college and monastic feasts, like the Corpus drinking horn, and symbols of land tenure, like the Pusey horn, supposedly given, along with the land it represents, by Cnut as a reward to one of his followers. The article is in vol. 21, numbers 1/2 of the AVISTA Forum Journal, a journal dedicated to the interdisciplinary study of medieval technology, science and art. 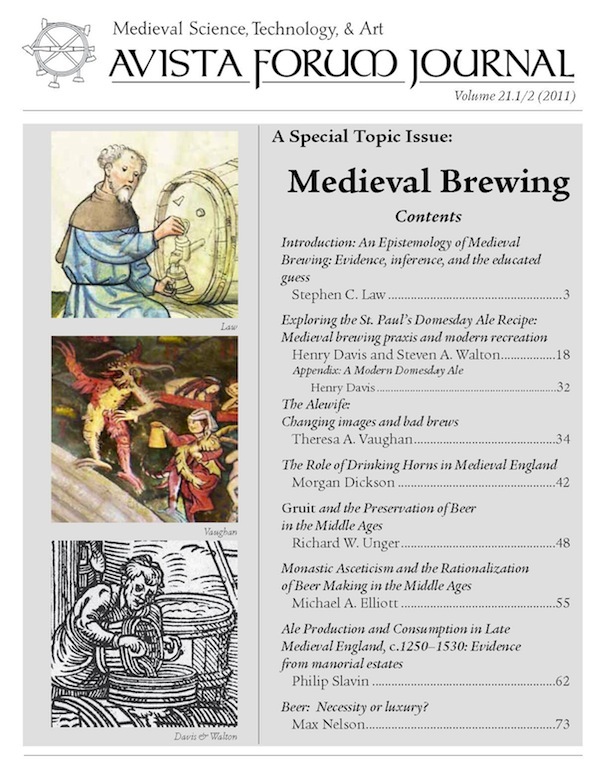 This is a special issue dedicated to Medieval Brewing which includes everything from a ‘Blessing of Beer’ to a study of the medieval alewife and an investigation into medieval brewing receipts and recipes. For more on the Corpus horn – including this excellent illustration of how not to drink from it, see Oliver Rackham’s Treasures of Silver at Corpus Christi College, Cambridge (Cambridge, 2002).